You should read this-but wait, a word of warning to any who would like to read this book before you rush off to buy a copy. If you are at all squeamish, uptight or believe being politically correct is important, you will not like this book. However, if you’re like me and can relate to a different sense of humor, and laugh at things that you feel guilty about laughing at, then you will LOVE this book. It’s short, fun and hilarious. And, for my Calgary readers, it takes place in very familiar territory (The Westin downtown by Eau Claire Market, and Prince’s Island Park), and I know this sounds strange, but reading books that take place in your own ‘hood are so much more fun to read. 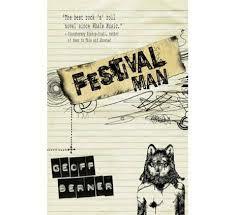 Festival Man is written by a Vancouver-based musician named Geoff Berner, who in his own words in an email to me earlier this year, stated that he frequently sells out his concerts at the Ironwood, so I’ll take that to mean that he plays good music. He also writes some good prose, which this book is evidence of. One of my favourite chapters is called “Soundman’s Guide” which acts as a toolkit for people who want to eventually become a ‘soundman’. It includes such helpful tips as the following: “If a musician makes a request for help or information, try to feign deafness and walk away”. Before anyone gets too offended, I feel obliged to point out that as someone in the music ‘biz’, Geoff is allowed to take these sarcastic pokes at other people in the industry since he’s been a part of it for so long! Having been a part of the festival industry in Calgary, I appreciated so many different aspects of this book. From the description of helpful Festival volunteers to the craziness of the late-night artist parties, so many things run true in this novel. Hell, the Festival I worked at is based out of the Westin too, so I could easily picture everything that Berner referenced. So I’m biased of course, because this book really speaks to my experiences and love of the Calgary Folk Festival, which acts as the feature setting for the story. I think I’m going to amend what I said at the beginning of this post, and recommend that even if you are easily offended, you should buy the book anyway, because it comes with a free download of a Geoff Berner CD that features other artists, and the music is so good it’s worth it. Besides, even if you don’t want to read the book in its entirety, the chapter titled “Arrival: Cowtown” offers a wonderfully sarcastic description of Calgary, which honestly, all Calgarians should read just for the fun of it. What’s better than that? Seeing Geoff perform live, which you can do this week at Wordfest!